This guide describes the prerequisites and provides step-by-instructions to install Red Hat Gluster Storage using different methods. Red Hat Gluster Storage is a software-only, scale-out storage that provides flexible and affordable unstructured data storage for the enterprise. Red Hat Gluster Storage 3.1 provides new opportunities to unify data storage and infrastructure, increase performance, and improve availability and manageability in order to meet a broader set of an organization’s storage challenges and requirements. Synchronize time across all Red Hat Gluster Storage servers using the Network Time Protocol (NTP) daemon. 22 For sshd used by geo-replication. 111 For rpc port mapper. 965 For NFS's Lock Manager (NLM). 2049 For glusterFS's NFS exports (nfsd process). 24007 For glusterd (for management). 24009 - 24108 For client communication with Red Hat Gluster Storage 2.0. 38465 For NFS mount protocol. 38466 For NFS mount protocol. 38468 For NFS's Lock Manager (NLM). 38469 For NFS's ACL support. 39543 For oVirt (Red Hat Gluster Storage-Console). 49152 - 49251 For client communication with Red Hat Gluster Storage 2.1 and for brick processes depending on the availability of the ports. The total number of ports required to be open depends on the total number of bricks exported on the machine. 54321 For VDSM (Red Hat Gluster Storage Console). 55863 For oVirt (Red Hat Gluster Storage-Console). 80 For HTTP protocol (required only if Nagios server is running on a Red Hat Gluster Storage node). 443 For HTTPS protocol (required only for Nagios server). 5667 For NSCA service (required only if Nagios server is running on a Red Hat Gluster Storage node). 5666 For NRPE service (required in all Red Hat Gluster Storage nodes). 963 For NFS's Lock Manager (NLM). Technology preview packages will also be installed with this installation of Red Hat Gluster Storage Server. For more information about the list of technology preview features, see Chapter 4. Technology Previews in the Red Hat Gluster Storage 3.1 Release Notes. While cloning a Red Hat Gluster Storage Server installed on a virtual machine, the /var/lib/glusterd/glusterd.info file will be cloned to the other virtual machines, hence causing all the cloned virtual machines to have the same UUID. Ensure to remove the /var/lib/glusterd/glusterd.info file before the virtual machine is cloned. The file will be automatically created with a UUID on initial start-up of the glusterd daemon on the cloned virtual machines. 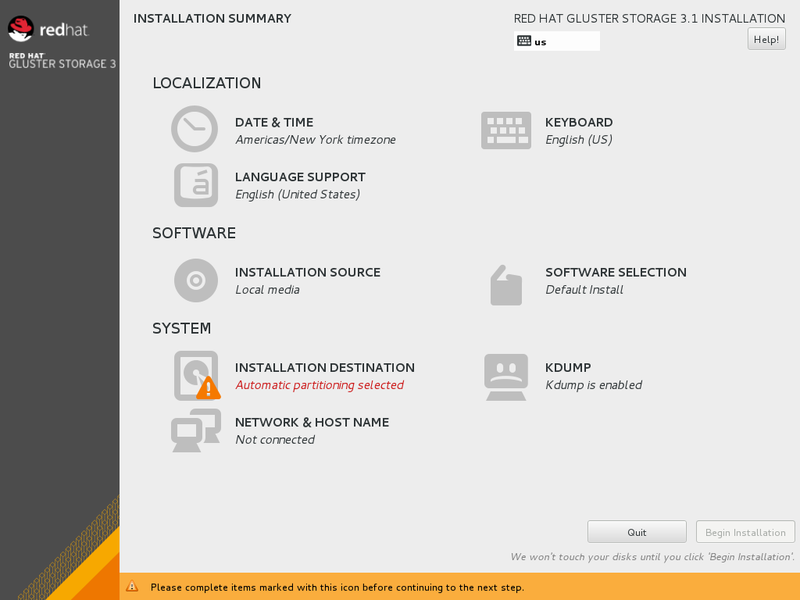 In the Welcome to Red Hat Gluster Storage 3.1 screen, select the language that will be used for the rest of the installation and click Continue. This selection will also become the default for the installed system, unless changed later. Instead of directing you through consecutive screens, the Red Hat Gluster Storage 3.1 installation program on Red Hat Enterprise Linux 7.2 allows you to configure the installation in the order you choose. To configure time zone, date, and optional settings for network time, select Date & Time. When the Red Hat Gluster Storage 3.1 on Red Hat Enterprise Linux 7.2 installation finishes and the system boots for the first time, any network interfaces which you configured during the installation will be activated. However, the installation does not prompt you to configure network interfaces on some common installation paths - for example, when you install Red Hat Gluster Storage 3.1 on Red Hat Enterprise Linux 7.2 from a DVD to a local hard drive. When you install Red Hat Gluster Storage 3.1 on Red Hat Enterprise Linux 7.2 from a local installation source to a local storage device, be sure to configure at least one network interface manually if you require network access when the system boots for the first time. You will also need to set the connection to connect automatically after boot when editing the configuration. To select the disks and partition the storage space on which you will install Red Hat Gluster Storage, select Installation Destination. 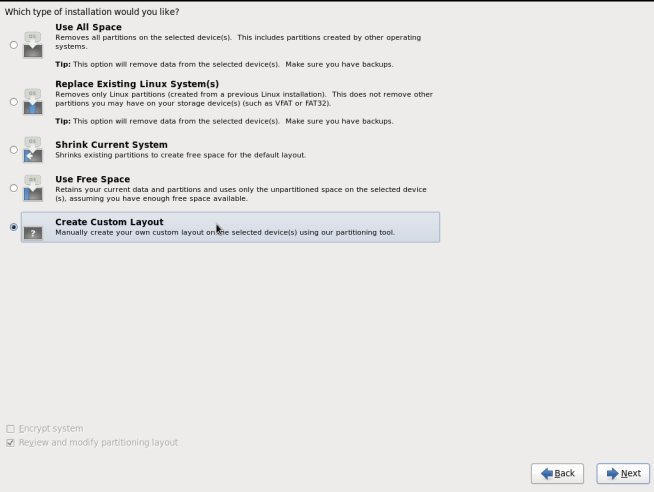 For more information on Installation Destination, see Section 6.13 in the Red Hat Enterprise Linux 7 Installation Guide. After installing Red Hat Gluster Storage, the glusterd service automatically starts on all the servers in the trusted storage pool. The service can be manually started and stopped using the glusterd service commands. gdeploy depends on Ansible to execute the playbooks and modules. You must install Ansible 1.9 to use gdeploy. Support for Hortonworks Data Platform (HDP) on Red Hat Gluster Storage integrated using the Hadoop Plug-In is deprecated as of Red Hat Gluster Storage 3.1 Update 2, and is unlikely to be supported in the next major release. Red Hat discourages further use of this plug-in for deployments where Red Hat Gluster Storage is directly used for holding analytics data for running in-place analytics. However, Red Hat Gluster Storage can be used as a general purpose repository for holding analytics data and as a companion store where the bulk of the data is stored and then moved to Hadoop clusters for analysis when necessary. Red Hat Gluster Storage provides compatibility for Apache Hadoop and it uses the standard file system APIs available in Hadoop to provide a new storage option for Hadoop deployments. Red Hat has created a Hadoop File System plug-in that enables Hadoop Distributions to run on Red Hat Gluster Storage. Before you begin installation, you must establish the basic infrastructure required to enable Hadoop to run on Red Hat Gluster Storage. The following table lists the supported versions of HDP and Ambari with Red Hat Gluster Storage Server. Must use fully qualified domain names (FQDN). For example rhs-1.server.com is acceptable, but rhs-1 is not allowed. SELinux must be in disabled mode. Time on all the servers must be uniform. It is recommended to set up a NTP (Network Time Protocol) service to keep the time synchronized. Either, all servers must be configured to use a DNS server and must be able to use DNS for FQDN resolution or all the storage nodes must have the FQDN of all of the servers in the cluster listed in their /etc/hosts file. Must have the following users and groups available on all the servers. If you have an existing Red Hat Gluster Storage trusted storage pool, you need to add two additional servers to run the Hortonworks Ambari Management Services and the YARN Master Services, respectively. For more information on recommended deployment topologies, see Administering the Hortonworks Data Platform on Red Hat Gluster Storage chapter in Red Hat Gluster Storage Administration Guide. In addition, all nodes within the Red Hat Gluster Storage Trusted Storage Pool that contain volumes that are to be used with Hadoop must contain a local glusterfs-fuse mount of that volume. The path of the mount for each volume must be consistent across the cluster. For information on expanding your trusted storage pool by adding servers, see section Expanding Volumes in the Red Hat Gluster Storage 3.1 Administration Guide. The supported volume configuration for Hadoop is Distributed Replicated volume with replica count of 2 or 3. SELinux must be in disabled mode. The rhs-hadoop-install script does not recognize SELinux in permissive mode and requires SELinux to be disabled completely. This requires additional restart of all storage machines. New Red Hat Gluster Storage and Hadoop Clusters use the naming conventions of /mnt/brick1 as the mount point for Red Hat Gluster Storage bricks and /mnt/glusterfs/volname as the mount point for Red Hat Gluster Storage volume. It is possible that you have an existing Red Hat Gluster Storage volume that has been created with different mount points for the Red Hat Gluster Storage bricks and volumes. If the mount points differ from the convention, replace the prefix listed in this installation guide with the prefix that you have. You must create a Red Hat Gluster Storage trusted storage pool with at least four bricks for two-way replication and with six bricks for three-way replication. The servers on which these bricks reside must have the Red Hat Gluster Storage installed on them. The number of bricks must be a multiple of the replica count for a distributed replicated volume. For more information on installing Red Hat Gluster Storage see Chapter 2, Installing Red Hat Gluster Storage or for upgrading to Red Hat Gluster Storage 3.1, see Chapter 9, Upgrading from Red Hat Gluster Storage 2.1.x to Red Hat Gluster Storage 3.1 . Red Hat recommends that you have an additional two servers set aside to run the Hortonworks Ambari Management Services and the YARN Master Services, respectively. Alternate deployment topologies are also possible, for more information on various supported deployment topologies, see Administering the Hortonworks Data Platform on Red Hat Gluster Storage chapter in Red Hat Gluster Storage Administration Guide. You must install Red Hat Gluster Storage Server on the server. While installing the server, you must ensure to specify a fully qualified domain name (FQDN). A hostname alone will not meet the requirements for the Hortonworks Data Platform Ambari deployment tool. You must also enable the rhs-big-data-3-for-rhel-6-server-rpms channel on this server. You must install Red Hat Enterprise Linux 6.6 on the servers. You can also choose to install Red Hat Gluster Storage Console on this server as well, but this is optional. This allows all aspects of the Red Hat Gluster Storage trusted pool to be managed from a single server. While installing the server, you must ensure to specify a fully qualified domain name (FQDN). A hostname alone will not meet the requirements for the Horton Data Platform Ambari deployment tool. It is mandatory to setup a passwordless-SSH connection from the Ambari Server to all other servers within the trusted storage pool. Instructions for installing and configuring Hortonworks Ambari is provided in the further sections of this chapter. If the Hortonworks Ambari server is installed on a different node than Red Hat Gluster Storage Server, you must also enable the rhel-6-server-rh-common-rpms channel on this server. Red Hat Gluster Storage Console enables Nagios Alerting for Red Hat Gluster Storage. The Nagios Client libraries are shipped with Red Hat Gluster Storage and are on each Red Hat Gluster Storage Server. This causes a conflict with the Nagios System that is bundled with the Hortonworks Data Platform (HDP). Hence, using Ambari to deploy and manage HDP Nagios is not supported. If you are using one of the condensed deployment topologies listed in the Administration Guide and you have elected to place the Ambari Management server on the same node as a Red Hat Gluster Storage Server, you must only enable the rhs-big-data-3-for-rhel-6-server-rpms channel on that server. You must install the Red Hat Enterprise Linux 6.6 on this server. While installing the server, you must ensure to specify a fully qualified domain name (FQDN). A hostname alone will not meet the requirements for the Horton Data Platform Ambari deployment tool. If the YARN Master server is installed on a different node than Red Hat Gluster Storage Server, you must also enable the rhel-6-server-rh-common-rpms and rhel-6-server-rhs-client-1-rpms channels on the YARN server. If you are using one of the condensed deployment topologies listed in the Administration Guide and you have elected to place the YARN Master server on the same node as a Red Hat Gluster Storage Server, you must only enable the rhs-big-data-3-for-rhel-6-server-rpms channel on that server. Only users that are part of the Hadoop group (that was created in the prerequisites section) will be able to submit Hadoop Jobs. This can be relatively easily if you are using LDAP for authentication, but if you are not, you need to run the command given below on each server in the trusted storage pool and the YARN Master Server, for each user you add. The UID of 1005 is arbitrary, you can specify the UID of your choice, but it must be both unique and consistent across the trusted storage pools. Also, the Hadoop Container Executor default properties require that all UIDs be greater or equal to 1000. Thus, 999 is not acceptable as user ID, but 1000 is acceptable. If you want to lower the default minimum acceptable UID, modify the min.user.id value in the /etc/hadoop/conf/container-executor.cfg file on every Red Hat Gluster Storage server that is running a NodeManager. After adding a user who is part of the hadoop group, you need to create a user directory for that user within the default Red Hat Gluster Storage Hadoop Volume. The default Red Hat Gluster Storage Hadoop Volume is the first volume that was created and enabled for Hadoop and is usually called HadoopVol according to the examples given in installation instructions. Run the following commands from a server within the Red Hat Gluster Storage trusted storage pool (replacing user_name with the actual user name) for each user that you are adding. You must run this command only once on the default Volume. If you add subsequent volumes, you do not need to repeat this step. To disable a user from submitting Hadoop Jobs, remove the user from the Hadoop group. 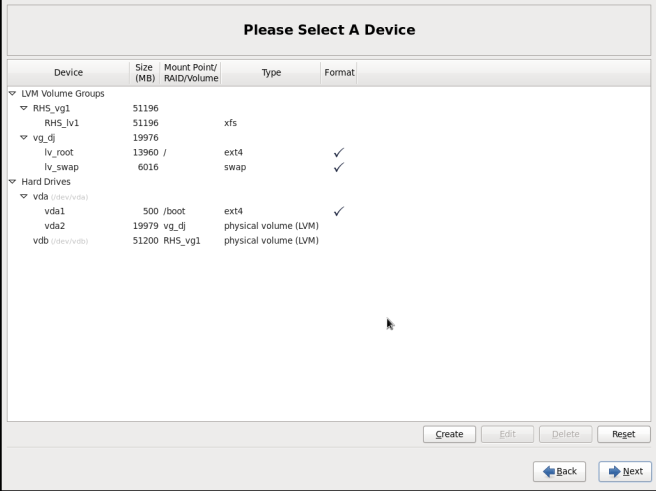 To keep a volume available for Red Hat Gluster Storage workloads, but not accessible to Hadoop jobs, you can disable the volume for use with Hadoop. Disabling a volume means that Hadoop jobs no longer have access to any data contained in the target volume; however, non-Hadoop workloads will continue to have access to this volume. The target volume is not deleted nor in anyway made unavailable to Red Hat Gluster Storage access. At a later time, disabled volumes can be re-enabled by executing the enable_vol.sh script. For information on enabling volumes using enable_vol.sh script, see Section 7.2.5, “Enabling Existing Volumes for use with Hadoop”. A volume is disabled by modifying the /etc/hadoop/conf/core-site.xml file. Specifically, the volume's name is removed from the fs.glusterfs.volumes property list, and the fs.glusterfs.volume.fuse.volname property is deleted. All Ambari services are automatically restarted. Updating from Red Hat Enterprise Linux 6 based Red Hat Gluster Storage to Red Hat Enterprise Linux 7 based Red Hat Gluster Storage is not supported. In Red Hat Enterprise Linux 7 based Red Hat Gluster Storage, updating to Red Hat Gluster Storage 3.1.x will reload firewall rules. All the runtime-only changes done until the reload, if it was not included in the permanent configuration, will be lost. To keep your Red Hat Gluster Storage system up-to-date, associate the system with the RHN or your locally-managed content service. This ensures your system automatically stays up-to-date with security patches and bug fixes. When there are large number of snapshots, ensure to deactivate the snapshots before performing an update. The snapshots can be activated after the update is complete. For more information, see Chapter 4.1 Starting and Stopping the glusterd service in the Red Hat Gluster Storage 3 Administration Guide. Offline upgrade results in a downtime as the volume is offline during upgrade. Make a complete backup using a reliable backup solution. This Solution covers one possible approach: https://access.redhat.com/solutions/1484053. Ensure that no new files are created on Red Hat Gluster Storage file systems during the backup. Check that the backup restores correctly before you continue with the migration. Restore backed up content to the newly created thinly provisioned LV. The update process automatically restarts the glusterd management deamon. The glusterfs server processes, glusterfsd is not restarted by default since restarting this daemon affects the active read and write operations. After all the nodes in the cluster are updated, the volume must be restarted for the changes to be applied. Red Hat recommends that you restart the system when there are no active read and write operations running on the cluster. NFS-Ganesha does not support in-service update, hence all the running services and IO's have to be stopped before starting the update process. Ensure that it stops pacemaker and cman. This will install glusterfs-ganesha and nfs-ganesha-gluster package along with other dependent gluster packages. Some warnings might appear during the upgrade related to shared_storage which can be ignored. Verify on all the nodes that the required packages are updated, the nodes are fully functional and are using the correct versions. If anything does not seem correct, then do not proceed until the situation is resolved. Contact the Red Hat Global Support Services for assistance if needed. Make sure there are no failures and unexpected results. Verify that all the nodes are fully functional. If anything does not seem correct, then do not proceed until the situation is resolved. Contact Red Hat Global Support Services for assistance if required. This chapter describes the procedure to upgrade to Red Hat Gluster Storage 3.1 from Red Hat Gluster Storage 3.0. If there is more than one volume, stop all of the volumes. You can upgrade to Red Hat Gluster Storage 3.1 from Red Hat Gluster Storage 2.1 Update 4 or later. If your current version is lower than Update 4, then upgrade it to Update 4 before upgrading to Red Hat Gluster Storage 3.1. Upgrade the servers before upgrading the clients. Execute the following command to migrate from Red Hat Network Classic to Red Hat Subscription Manager. It is recommended to add the child channel of Red Hat Enterprise Linux 6 that contains the native client to refresh the clients and access the new features in Red Hat Gluster Storage 3.1. For more information, refer to Installing Native Client in the Red Hat Gluster Storage Administration Guide. Reboot the servers. This is required as the kernel is updated to the latest version. Log in to the Red Hat Satellite server. This uses the prepared Activation Key and re-registers the system to the Red Hat Gluster Storage 3.0 channels on the Red Hat Satellite Server. Run the following command to upgrade to Red Hat Gluster Storage 3.0. Reboot, and run volume and data integrity checks. This method re-images the software in the storage server by keeping the data intact after a backup-restore of the configuration files. This method is quite invasive and should only be used if a local yum repository or an Internet connection to access Red Hat Network is not available. The preferable method to upgrade is using the yum command. For more information, refer to Section 9.1.1, “Upgrading from Red Hat Gluster Storage 2.1.x to Red Hat Gluster Storage 3.1 for Systems Subscribed to Red Hat Network”. Ensure that you perform the steps listed in this section on all the servers. In the case of a geo-replication set-up, perform the steps listed in this section on all the master and slave servers. You cannot access data during the upgrade process, and a downtime should be scheduled with applications, clients, and other end-users. Make a note of this information to compare with the output after upgrading. If there are any gluster processes still running, terminate the process using kill. Ensure that the backup directory is not the operating system partition. Also, back up any other files or configuration files that you might require to restore later. You can create a backup of everything in /etc/. Insert the DVD with Red Hat Gluster Storage 3.1 ISO and reboot the machine. The installation starts automatically. You must install Red Hat Gluster Storage on the system with the same network credentials, IP address, and host name. During installation, while creating a custom layout, ensure that you choose Create Custom Layout to proceed with installation. If you choose Replace Existing Linux System(s), it formats all disks on the system and erases existing data. Select Create Custom Layout. Click Next. Select the disk on which to install Red Hat Gluster Storage. Click Next. For Red Hat Gluster Storage to install successfully, you must select the same disk that contained the operating system data previously. While selecting your disk, do not select the disks containing bricks. After installation, ensure that the host name and IP address of the machine is the same as before. If the IP address and host name are not the same as before, you will not be able to access the data present in your earlier environment. Add entries to /etc/fstab to mount data disks at the same path as before. Ensure that the mount points exist in your trusted storage pool environment. Copy /var/lib/glusterd and /etc/glusterfs from your backup disk to the OS disk. Do not restore the swift, samba and ctdb configuration files from the backup disk. However, any changes in swift, samba, and ctdb must be applied separately in the new configuration files from the backup taken earlier. Copy back the latest hooks scripts to /var/lib/glusterd/hooks. Ensure you restore any other files from the backup that was created earlier. Repeat the above steps on all the servers in your trusted storage pool environment. In case of an Object Store set-up, any configuration files that were edited should be renamed to end with a .rpmsave file extension, and other unedited files should be removed. Re-configure the Object Store. For information on configuring Object Store, refer to Section 18.5 in Chapter 18. Managing Object Store of the Red Hat Gluster Storage Administration Guide. Ensure that the output of these commands has the same values that they had before you started the upgrade. In Red Hat Gluster Storage 3.0, the gluster peer status output does not display the port number. If all servers in the trusted storage pool are not upgraded, the gluster peer status command displays the peers as disconnected or rejected. If all systems in the trusted storage pool are upgraded, the gluster peer status command displays peers as connected. If all the volumes in the trusted storage pool are started, the gluster volume info command displays the volume status as started. If the SSH connection for your setup requires a password, you will be prompted for a password for all machines where the bricks are residing. Re-create and start the geo-replication sessions. 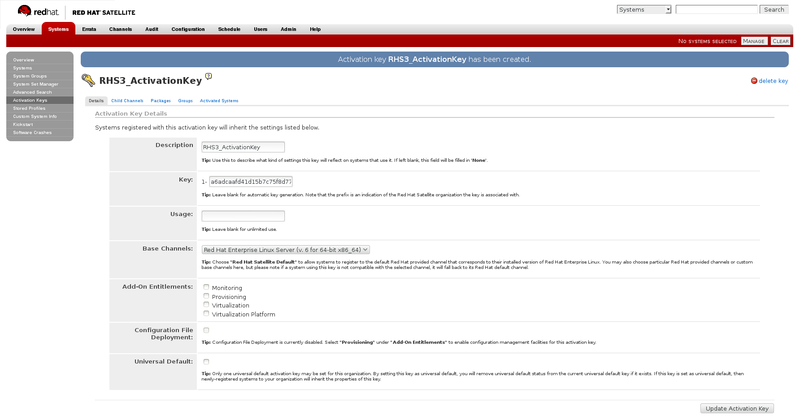 For information on creating and starting geo-replication sessions, refer to Managing Geo-replication in the Red Hat Gluster Storage Administration Guide. It is recommended to add the child channel of Red Hat Enterprise Linux 6 containing the native client, so that you can refresh the clients and get access to all the new features in Red Hat Gluster Storage 3.1. For more information, refer to the Upgrading Native Client section in the Red Hat Gluster Storage Administration Guide. Remount the volume to the client and verify for data consistency. If the gluster volume information and gluster peer status information matches with the information collected before migration, you have successfully upgraded your environment to Red Hat Gluster Storage 3.0. This section describes the upgrade methods for a Red Hat Gluster Storage and Red Hat Enterprise Virtualization integrated environment. You can upgrade Red Hat Gluster Storage 3.0 to Red Hat Gluster Storage 3.1 using an ISO or yum. Perform the ISO Upgrade as mentioned in Section 9.1.3, “Upgrading from Red Hat Gluster Storage 2.1.x to Red Hat Gluster Storage 3.1 using an ISO”. Re-installation for the Red Hat Gluster Storage nodes should be done from Red Hat Enterprise Virtualization Manager. The newly upgraded Red Hat Gluster Storage 3.1 nodes lose their network configuration and other configurations, such as iptables configuration, done earlier while adding the nodes to Red Hat Enterprise Virtualization Manager. Re-install the Red Hat Gluster Storage nodes to have the bootstrapping done. 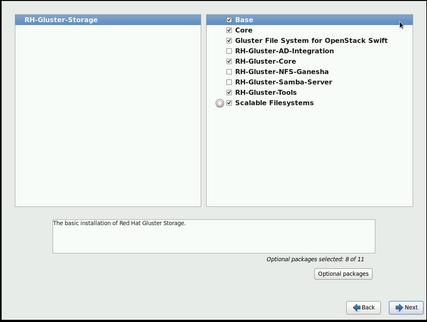 You can re-configure the Red Hat Gluster Storage nodes using the option provided under Action Items, as shown in Figure 10.2, “Red Hat Gluster Storage Node before Upgrade ”, and perform bootstrapping. If Red Hat Enterprise Virtualization Hypervisor is used as hypervisor, then install the suitable build of Red Hat Enterprise Virtualization Hypervisor containing the latest native client. Moving kernel version check to be more timely, BZ#1322657. Version for RHGS 3.1 Update 2 release. Updated glusterfs package version for RHGS 3.1.2. BZ-1295034: Updated the command in Using Subscription Manager. Added version details table, BZ#1291527. Corrected reference to version details table, BZ#1256734. Added notes re. migration to thinly provisioned logical volumes, BZ#1259412. Clarified meaning of 'previous release' in upgrade chapter, BZ#1256734. Samba does not support in-service upgrades, BZ#1282603. Building for async docs update. Version for 3.1 Update 1 GA.
Added installation steps for RHGS on RHEL 7. Copyright © 2015-2016 Red Hat, Inc.